Iranian officials say more than 400 people are dead after a powerful earthquake struck along the country's border with Iraq Sunday night. A spokesman for Iran's crisis management headquarters spoke to reporters on Monday. He said that about 6,700 people were injured in the earthquake. At least seven people were killed in Iraq, the Associated Press (AP) reported. In the United States, scientists described the quake as being 7.3 in magnitude – a measurement of its relative size. The U.S. Geological Survey said the quake was centered near the city of Halabja in eastern Iraq. But small tremors were felt as far west as the Mediterranean coast. Reports say the worst damage appeared to be in Iran's western province of Kermanshah. In Iraq, health officials said that, in Kurdish areas, the quake killed seven people and injured more than 500 others. The quake also is believed to have damaged a dam on the Diyala River in Iraq. The dam's director told the AP that the dam was built in 1961. He said it was very strong, but had very clear damage. Iraqi Prime Minister Haider al-Abadi said he has directed health and aid agencies to provide assistance. Electricity and water were cut off in several cities in both Iraq and Iran. 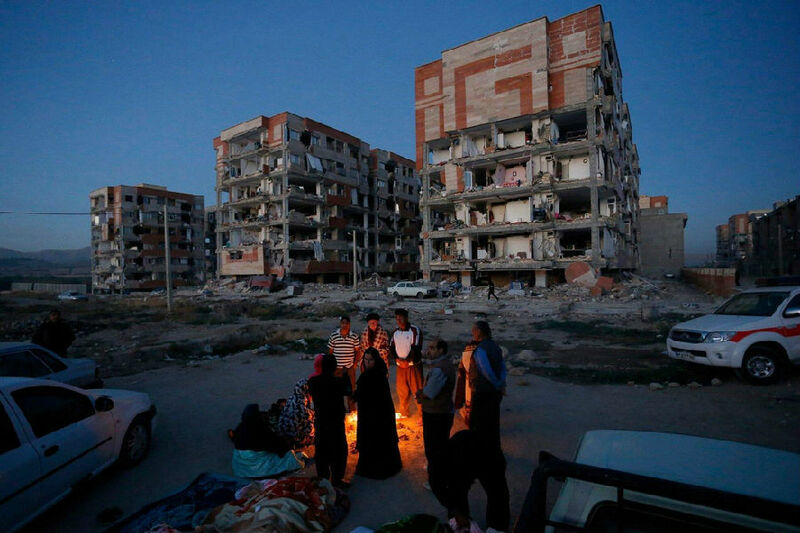 Media reports from Iran say the quake has affected at least 14 provinces. Iranian state media appealed for blood donations. In Iran, blocked roads have made it difficult for rescue workers to reach distant villages. Officials say rescue efforts have been slow. The head of the Iranian Red Crescent said that more than 70,000 people need emergency shelter. International aid efforts have begun. The vice president of the Turkish Red Crescent told the AP that 33 aid trucks were being sent to the Iraqi city of Sulaimaniyah. Three thousand tents and heaters, 10,000 beds, blankets and food are among the aid items being sent. Turkey also said it would help Iran if aid is requested. Major earthquake fault lines run through Iran, causing quakes. Some of them are very powerful. In 2003, a magnitude 6.6 earthquake destroyed the historic city of Bam and killed 26,000 people. More recently, in 2012, a major earthquake centered in East Azerbaijan province killed 300 people. They said all countries need to strengthen oversight and crisis management mechanisms. All of the aid items that are absolutely essential in a situation like this where people have fled with nothing. The military has been ordered by radio to the local population emergency shelter order. Blood donations are also being collected on university campuses. 5.But small tremors were felt as far west as the Mediterranean coast. As far as I know he'll be away for three months. I'll keep you company as far as the station. 6.Electricity and water were cut off in several cities in both Iraq and Iran. The rebels have cut off electricity from the capital.